An Aussie mum has slammed the "terrible" Coles Little Shop campaign after finding one of the toys on a Bali beach. Stephanie Shaw, from Brisbane, was visiting the Indonesian island earlier this month for a conference when she made the concerning discovery. There is no evidence to prove the toy washed up on the beach after travelling through the ocean from Australia, and it is possible it was simply brought over by an Aussie tourist and lost in the sand. However, the 40-year-old veterinarian and wildlife lover said the toys were still damaging to the environment. "We were having a little break and went down to the beach to get a drink. In the conference, we had only just been talking about marine conservation and plastic pollution," Yahoo 7 reported Ms Shaw as saying. "As we were walking along, we noticed the amount of rubbish and plastic on the shore. Then all of a sudden, I spotted this familiar Coles 'Little Shop' plastic Nutella toy laying in the sand. "I couldn't believe it. It was actually kind of fitting as Nutella itself is full of palm oil, which is devastating Indonesia's rainforests and killing the orang-utan population." Ms Shaw said plastic could be deadly to wildlife. "That little piece of plastic could have easily landed in a sea turtle's mouth or been swallowed by a bird," she said, according to Yahoo 7. "It's just a terrible campaign. We should be straying away from plastics altogether. They are not thinking about the environment. They're not recyclable at all. "They should think about the consequences of where these toys end up. There are thousands of these little plastic toys out there now, and plastic will never break down." Coles released 30 mini toy versions of popular products including Weet Bix, Vegemite and Nutella during the Little Shop campaign, which launched in July this year. Shoppers scored one free item with every $30 spent in-store, and before long, it had become a bona fide trend, with some items reportedly being sold online for astronomical prices as parents attempted to amass the entire collection. 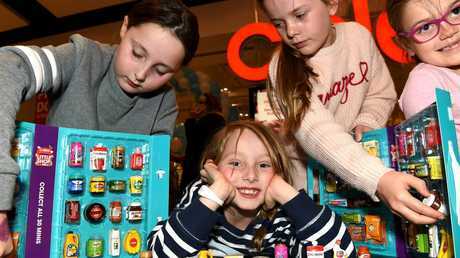 It was so popular Facebook groups solely dedicated to swapping the toys began popping up on social media, and planned swap days were held in some Coles stores. Last month, Coles also reported comparable sales growth of 5.1 per cent in the first quarter of the financial year off the back of the highly successful Little Shop campaign. Headline supermarket sales for the 13 weeks from June 25 to September 23 were up 5.8 per cent to $7.66 billion. Including liquor and convenience, Coles' total sales were up 5 per cent to $9.84 billion. However, it also sparked some controversy at the time regarding the environmental impact of the toys - especially given Coles and Woolies had banned free single-use plastic bags just before the campaign was launched. A Coles spokeswoman told news.com.au the campaign had been a huge hit and that the company took environmental concerns seriously. "Coles' Little Shop was very popular with customers, with many sending minis to family and friends living overseas," the spokeswoman said. "At Coles we take our responsibility for managing our environmental and social impacts seriously. As a business we are committed to recycling and minimising waste. "The Little Shop campaign ran for a limited time, the incredibly popular mini collectibles were built to last and customers were able to recycle the wrappers at their nearest store through our in-store REDCycle program." Aussies who no longer want their Little Shop collections can donate them to a number of disability groups who use them with children in their programs, such as Distinctive Options in Sunbury, Victoria.